Hi all! 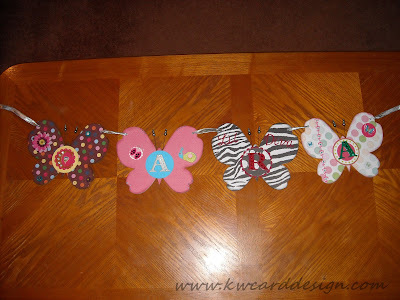 I'm back to share with you what I created for a special little girl who is turning a year old coming up in July. 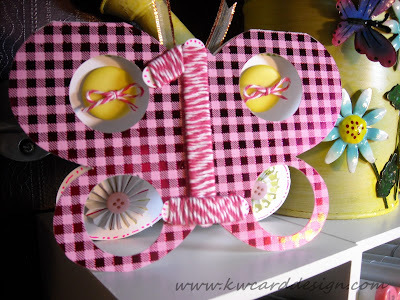 One of my co-workers has a granddaughter who is turning a year old, and she saw the Butterfly Chipboard Banner I made a few weeks back, and wanted me to make her granddaughter Cara one. I also made her a birthday card as well. Both projects turned out better that I expected - especially the birthday card. First here is the banner. Again, her name is Cara. She wanted it to be very "girly girl". The best part about the banner is this can stay with her, and be displayed in her room for years to come - and not just for her "First" birthday. Now here is the birthday card I made her. I already had in mind that I had some butterfly shaped cards. I added some pink patterned patter from K & Company from the Sweet Nectar 6x 6 pad. I, then took my 1 1/4" circle punch from SU!, and punched out 4 circles in the middle of the butterfly's wings, and I added two rosettes with buttons, and then, I added two yellow buttons from American Crafts and added some hot pink baker's twine to them. I attached all these embelly's with Glossy Accents from Ranger - it is my go to adhesive for when I want something to stick for the long haul. :) Then, I took my word window punch also SU! and punched out two pieces of white card stock, and glued them together to created a longer strip, and I wrapped that same baker's twine around those punched pieces - I eventually created the number "1", to accent that this was for Cara's first birthday. I also added some ribbon for the "antenna". I didn't take a picture of the inside, but I did some faux stitching with a bright pink gel pen, and really added to the inside of the card with the embellishments, and at the top of the two yellow buttons, I added a "Happy Birthday" sentiment. There was enough room in the middle for Sandy ( grandma) to add her message if she wanted to. I think her mom and dad will just love it - and it is something they can treasure for her, and keep in a keepsake book , or scrapbook even. I love being challenged with my crafts!! This is one of those times where I was so full of pride and joy of how it all turned out - and it makes it all worth it when the recipient loves it too!!! Kari I love the banner you made for Cara, it definitely is perfect to have in her room until she moves out of the house! The card is amazing, it has so many details to it! Love that you made the '1' like the body, so creative!